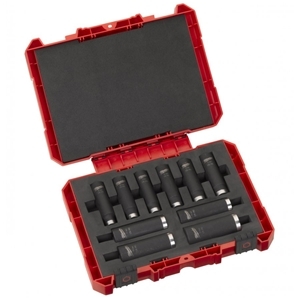 Milwaukee Shockwave 10 piece impact 1/2 inch socket set. Contents: 8 / 10 / 11 / 12 / 13 / 14 / 16 / 17 / 19 / 21 mm sockets. Impact duty (Chrome-Molybdenum) steel is high quality alloy steel which provides ultimate strength and durability. Deep wall construction provides clearance for protruding bolts. Laser etched size markings for easy identification and won’t wear off.